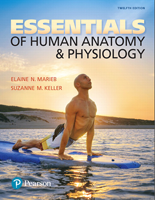 Human Anatomy & Physiology, by best-selling authors Elaine Marieb and Katja Hoehn, motivates and supports learners at every level, from novice to expert, equipping them with 21st century skills to succeed in A&P and beyond. Each carefully paced chapter guides students in advancing from mastering A&P terminology to applying knowledge in clinical scenarios, to practicing the critical thinking and problem-solving skills required for entry to nursing, allied health, and exercise science programs. From the very first edition, Human Anatomy & Physiology has been recognized for its engaging, conversational writing style, easy-to-follow figures, and its unique clinical insights. The 11th Edition continues the authors’ tradition of innovation, building upon what makes this the text used by more schools than any other A&P title and addressing the most effective ways students learn. Unique chapter-opening roadmaps help students keep sight of “big picture” concepts for organizing information; memorable, familiar analogies describe and explain structures and processes clearly and simply; an expanded number of summary tables and Focus Figures help learners focus on important details and processes; and a greater variety and range of self-assessment questions help them actively learn and apply critical thinking skills. To help learners prepare for future careers in health care, Career Connection Videos and Homeostatic Imbalance discussions have been updated, and end-of-chapter Clinical Case Studies have been extensively reworked to include new NCLEX-Style questions. 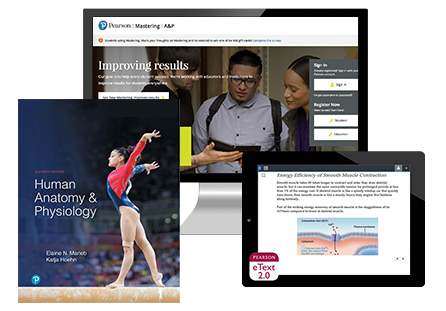 Mastering A&P features new Interactive Physiology 2.0 tutorials, new Focus Figure Mini-Animations, and new customizable Practice Anatomy Lab (PAL 3.1) Flashcards, complementing Human Anatomy & Physiology and providing a cohesive learning experience for today’s learners.